Foreign direct investment inflows to the United States are big business. In 2012 alone, the U.S. attracted more than $160 billion in foreign direct investment, making our nation the world’s top destination for foreign direct investment. In 2011, foreign-owned companies in the U.S. were responsible for employing 5.6 million U.S. workers. In San Diego, foreign direct investment supports more than 48,000 jobs, which pay an average of 30 percent more than industry average. Even though foreign owned firms in San Diego account for 5 percent of the region’s employment, they account for nearly 19 percent of all corporate R&D spending, 12 percent of the productivity growth, and 20 percent of the total goods exported. The story of Althea Technologies, now known as Ajinomoto Althea, began in 1998, when Magda Marquet and Francois Ferre established Althea Technologies in San Diego and began developing plasmid kits and other related life sciences products. 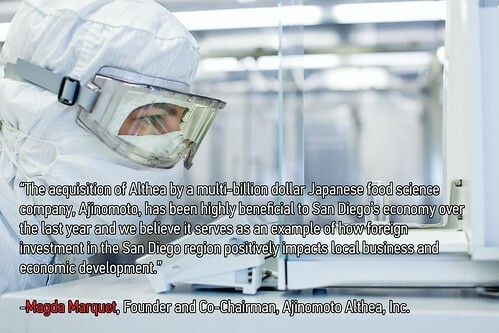 After 15 years of development and growth, the company was acquired by global Japanese manufacturer Ajinomoto Co. for approximately $175 million, which not only was a boon to San Diego’s economy, but also served to strengthen its ties to Tokyo and Japan. Foreign direct investment from Japan in San Diego is a crucial part of the discussion when talking about our global competitiveness. Tokyo invests more in San Diego more than any other city, accounting for 13 percent of all foreign direct investment in San Diego. These investments bring capital, jobs and opportunities to the region and are important in supporting San Diego’s advanced industries. Aside from explicit economic gains, these foreign ties will prove to be indispensable strategic partnerships for San Diego in the coming decades. Projections say that by 2030, 66 percent of the global middle class will be in Asia. Partnerships made in Asia today will undoubtedly pay dividends tomorrow. At the dawn of “America’s Pacific Century,” San Diego has the potential to be a national leader in the face of a changing economy. On March 11 at San Diego’s Global Summit, Ajinomoto Althea and key leaders will launch the Go Global Trade and Investment Initiative. The summit is SOLD OUT. You can catch the event live, starting at 11:45 am, courtesy of U-T San Diego. Join us as we formally launch the Go Global San Diego global competitiveness initiative on March 11. Subscribe here to receive new posts every Wednesday on this topic.